Update: The Pageaddict extension is not compatible with newer versions of the Firefox web browser. While there is no comparable extension available for Firefox, you can use a program like SeriousD instead which keeps track of the websites you open in Firefox and more. Monitoring the time spent online can be useful for some users and especially businesses. Most applications and browser plugins provide basic time monitoring options that record the time spent online but that is about it. Pageaddict is a time tracking add-on for the Mozilla Firefox web browser that uses a different measuring technique. It records the total time that the user spent in the web browser, as well as the time spent on individual websites. The developer of the add-on has created it to inform Firefox users of their browsing habits. This can help in analyzing those habits. If you notice that you spend most of your work day on Facebook, you may decide to do something about that. This is done by looking at the sites you visited, and the time spent on each of the listed sites using the extension. It can however also be used to record the times spent on websites for business or educational purposes. Pageaddict is active right after the installation of the add-on in the web browser. 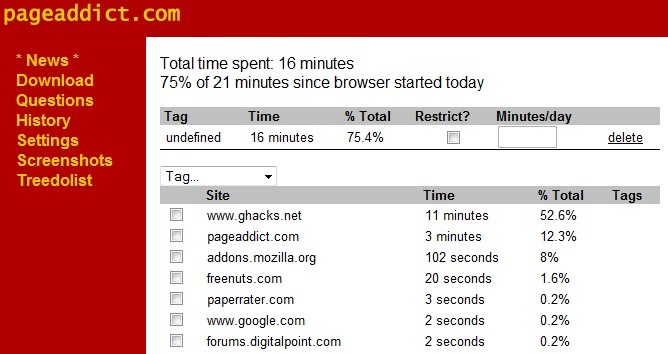 The statistics of the time spent online can be loaded from the Firefox Tools menu, or by directly visiting the Pageaddict website. Tags can be defined to sort websites into categories to make the identification easier. It is for instance possible to create the tags work, research, downloads and entertainment to see how much time is spent in each of the categories. The websites need to be linked to tags after their creation which may take a while. Also, you may need to update the site listing for each category when you visit new sites that are not classified yet. Pageaddict does not store information about the websites that are visited by the user remotely. All information are stored locally according to the developer of the extension. The Firefox add-on can be downloaded from the Mozilla website. This is great Martin, exactly what I was looking for. Thanks! 1. You have to go to the developers web page to see the statistics. 2. According to the FAQ, every evening, they erase the individual site log and just keep the times spent categorized under a global name like NEWS. This is a major negative for me. 3. It appears that development has been abandoned. I used this for all of yesterday but have disabled it now. 1. It has a serious memory leak and also noticeably impacts FF performance. 2. There is not way to stop the program from wiping the days data at 12 midnight and consolidating the data. There is no auto export function to save the raw data. 3. The program is abandoned and no longer supported. Perhaps some programmer will take this add-on over, update it and fix the problems.